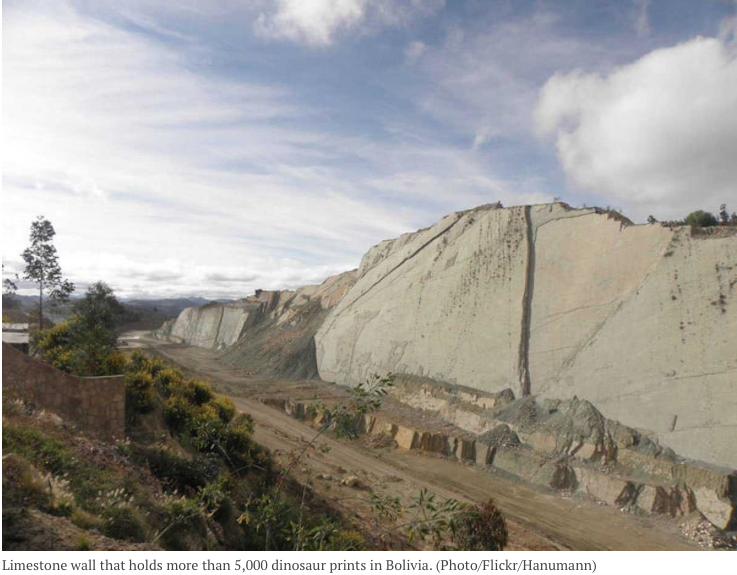 Authorities in Bolivia seek world heritage status for a massive limestone wall with thousands of dinosaur prints. The wall is more than 300-feet long and is located near the city of Sucre. Investigators have counted more than 5,000 dinosaur prints from around nine different species. The site has become one of Bolivia’s most visited destinations with nearly 200,000 visitors every year. Officials are expected to apply for world heritage status with UNESCO in September. World heritage status would grant the site international funding for protection and conservation, as well as officially designate it as a tourist destination. This entry was posted in Bolivia, Environment, Tourism and tagged Chuquisaca, fossil, Sucre. Bookmark the permalink.